Sorry for the little gap in time folks. After a wonderful time-off relaxing at home, it was time to get back to work-literally. It’s been super busy these past three days, so I am a little behind in posting this day. Day Twenty Eight marks the fifteenth day remaining until I complete my One Zentangle a Day Challenge. On a quick side note, I know I haven’t always been consistent in posting these back to back days, but that doesn’t mean I stopped drawing in between days even with my own personal struggles. 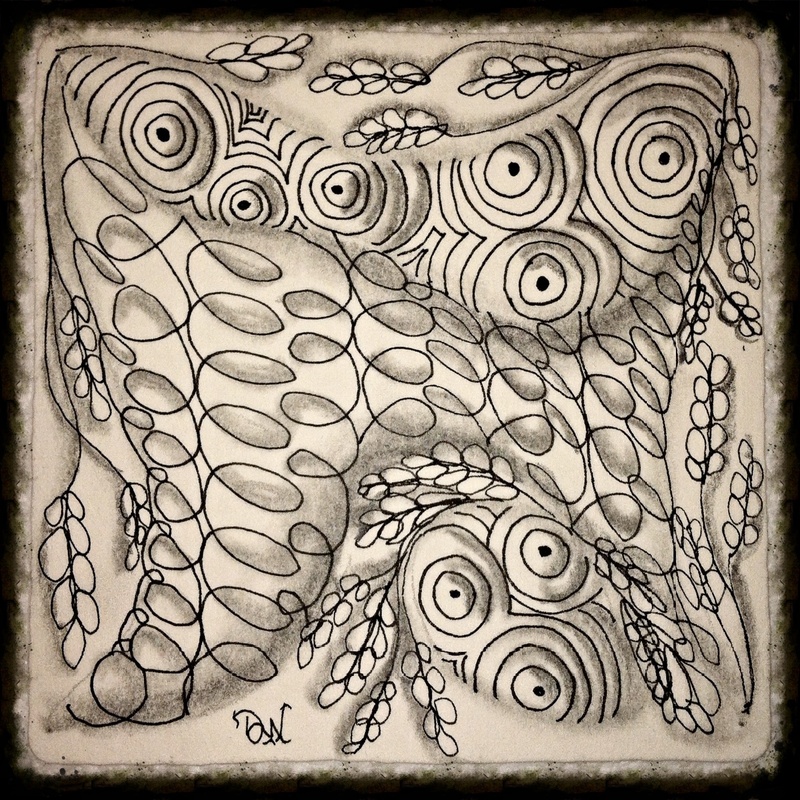 If you decide to pick up the book “One Zentangle a Day” the book is full of prompts to not only create a daily tile, but also encourages you to practice in a journal as you learn each new tangle, technique, and or new medium (i.e. colored pencils, watercolor, gouache etc.). Eventually I will get around to posting some of my journal entries, but will probably reserve them for my Flashback Friday posts. Now that I got thoroughly got side-tracked, let me tell you a little about today’s tile. This was a fun and quick tile to learn and do. Believe it or not it only incorporates just two newly learned tangles. The tangle called “Sez” is formed by drawing uniform lines around a single dot to create a circular pattern. In shading Sez, I decided to shade one half of the circles to give a much defined look and feeling of depth. The second tangle used is called “Eke” which loops around across the tile in a non-uniform pattern. Eke is a very versatile tangle where several tangleations can be created from this single pattern. One of the tangleations of Eke I used is the one that appears to be small leaf-like petals that surround the tile. I loved the overall effect of using both Eke and Sez within the same tile and really enjoyed learning these two patterns. For a quick sneak peek into day twenty nine, this day is asking me to create my very own pattern for the first time- yikes! Well, you’ll have to wait until the next post to see what I come up with. Previous Post Snowbound! Project: Redecorate our Mantle to the rescue! Another great tile! They say “in the eyes of the beholder” … this appears to me as a sandy beach, with sea creature eyes, peering through the seaweed : ) … With that said … I love it and your work! Can’t wait for your own Zentangle creation!! !